Part of the rising popularity of lidar technology is its sheer flexibility. The incredibly detailed 3D maps that it enables are useful for tasks as diverse as geological monitoring, civil engineering, disaster response, forestry and archaeology. Indeed, a single dataset can find use in new applications that weren’t even considered when it was originally collected. 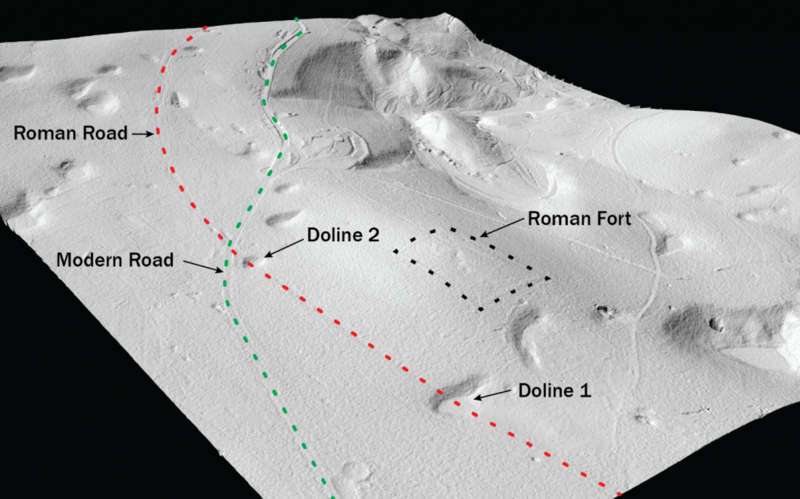 A recent study by Italian archaeologists on “second-hand” lidar data is a perfect example of this, showing how data originally collected for environmental protection could be used to examine ancient Roman ruins and roads, which in turn lead to new revelations about geomorphology. In 2009, Helica s.r.l. used a Teledyne Optech airborne lidar terrain mapper (ALTM) to survey Italy’s Friuli Venezia Giulia region in high detail, collecting 4–5 laser points per square meter. The data was originally used by the local authorities to monitor the environment in the area, but it was also made available to a group led by Dr. Federico Bernardini at the “Abdus Salam” International Centre for Theoretical Physics in Trieste, who decided to use it for archaeological research. Before the advent of lidar, the thick forests in the area made it difficult to survey by air, particularly since two millennia of neglect have eroded most walls to barely a meter high. Thankfully, Teledyne Optech’s lidar systems can penetrate even the smallest crack in the forest’s canopy to survey the ground underneath. By separating the ground and non-ground points in the lidar data, the researchers could see the bare earth as a digital elevation map (DEM). This new map revealed a treasure trove of features, from possible pre-historic graves to farming terraces and land markers. The researchers were particularly excited to find three strategically placed forts, as these are the first ever Roman military fortifications found in Italy itself. After discovering the forts, the researchers wanted to locate the roads through the nearby Trieste Karst that linked them to other settlements in the region, as described in surviving Roman records. While the Romans generally preferred straight roads, the karst contains hills, narrow valleys, and hundreds of dolines up to 400 m, so the route likely hugged the terrain to minimize climbing. To calculate this route, the archaeologists turned again to the lidar data. First, they divided the lidar DEM into small cells and determined the energy cost needed to travel through each one based on its slope. Then, they combined the cells to calculate the route through the karst that required the least total effort, and searched through the lidar data for any traces of the road in that area. This simulation proved quite accurate, as close examination of the lidar data showed linear depressions near the predicted route. The accuracy of the Teledyne Optech lidar was critical to locating these features, as the depressions were just a few tens of centimeters deep. It would have required considerable amounts of footwork through the forests of the area to locate these features, and they were so subtle that searchers might miss them even when walking right over them. To confirm that the feature was a road, the archaeologists visited a particularly well-preserved section near one of the Roman forts. 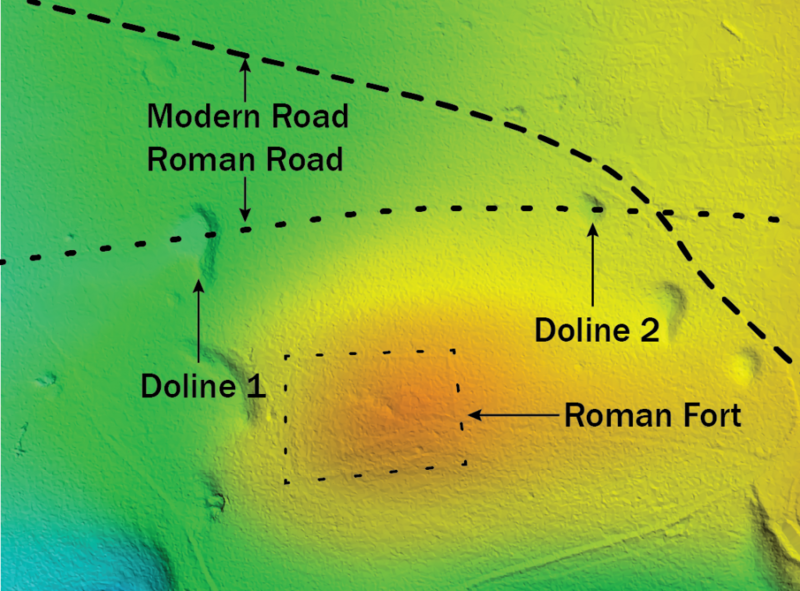 Ground-penetrating radar revealed a groove 8–10 m wide in the underlying limestone of the karst, but even more convincing were the hundreds of small Roman hobnails that they found. Such hobnails were attached to the soles of legionnaires’ sandals to improve their durability and grip, and the feature was positively littered with them, strongly suggesting that it was indeed an ancient roadway. The hobnails also helped the team to date the feature properly, since the Romans made different types of hobnails over the centuries. The earliest type of hobnail found entered use during Caesar’s Gallic Wars (mid-1st century BC) or a little earlier, suggesting that the feature was built after that period. On the other hand, the latest type of hobnail was mainly found in the 1st and 2nd century AD, suggesting that it was mostly abandoned after that point. However, the lidar data showed something strange: Near the fort, two large dolines or sinkholes interrupted the possible road. These sinkholes were considerable obstacles, one being 20 m wide and the other 40 m, but there was no evidence of a bridge across them. This led the researchers to believe that the sinkholes formed after the road was abandoned, making them at most 2,000 years old. This is relatively recent in geological terms, and provided unexpected proof that sinkholes can develop quickly in a karst landscape. It also proves that archaeologists in general must be careful when drawing conclusions about how Romans used the area, because the current landscape may have looked considerably different in ancient times. This project shows the versatility of lidar data. The original dataset from the Teledyne Optech ALTM, collected by Helica for environmental monitoring, proved very useful for detecting the faint remains of Roman roads underneath wooded areas. Unexpectedly, it also gave geologists new insight into the rate of sinkhole formation in the area’s karst, meaning this single dataset has contributed to the fields of environmental monitoring, archaeology, and geology, all at once.